Graphene, the versatile miracle material that can be used for everything from creating better speakers for hearing aids to body armor that’s stronger than diamonds, has another application to add to its résumé. In the U.K., engineers at the University of Central Lancashire (UCLan) recently unveiled the world’s first graphene-skinned plane at the “Futures Day” event at Farnborough Air Show 2018. Called Juno, the 11.5-feet wide unmanned airplane also boasts graphene batteries and 3D-printed parts. The combination adds up to a pretty darn impressive whole. 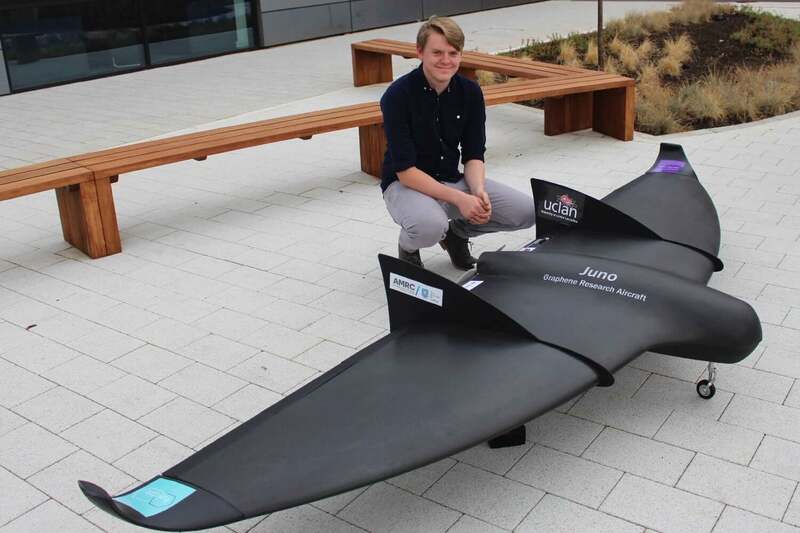 While the 3D-printed elements and graphene batteries are certainly exciting, the graphene-skinned wings are the most promising part of the project. Specifically, it is hoped that the use of graphene can help reduce the overall weight of the aircraft to increase its range and potential payload. This is made possible because the graphene carbon used in Juno is around 17 percent lighter than standard carbon fiber. Other properties of the graphene can help it counter the effects of potentially dangerous lightning strikes, due to its extreme conductivity, and protect the aircraft against ice buildup during flight. Working with UCLan on the project is the Sheffield Advanced Manufacturing Research Center, University of Manchester’s National Graphene Institute, Haydale Graphene Industries, and assorted other businesses and research institutes. With Juno having made its stunning public demonstration, the next phase of the operation will include further tests to be carried out over the next two months. Should all go according to plan, airplanes such as this may well turn out to a particularly promising line of inquiry for graphene-related initiatives.